Falcon’s Cheerleaders and Falcon’s Alumni Ray Buchanan visits Savannah. The Savannah Tribune has team up with the Atlanta Falcons to promote Rise Up Savannah. This is a program designed to celebrate the Falcons 2013-14 season and encourage Falcon Fans of all ages to wear RED or Falcons gear every Friday throughout the season. There are several promotional elements or prizes for distribution in the Savannah market including game ticket give-aways. 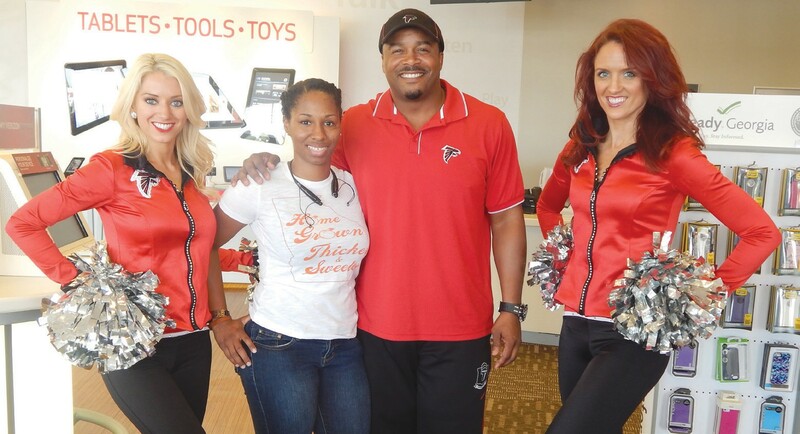 On last Saturday, Atlanta Falcon Alumni Ray Buchanan along with the Falcon cheerleaders made an appearance at the Verizon Wireless Store on Abercorn. Put on your Falcon gear or RED for Rise Up Friday to be held on Friday, October 4th at City Market/Ellis Square from noon until 2pm. There will also be a Heads Up Football Clinic on October 8th at Benedictiine Military School 6-7pm. On Tuesday, October 15 there will be a Tailgate Team Appearance at Publix in Twelve Oaks Shopping Center. The Savannah Tribune will have a ticket givea way. Like us on facebook page: www.facebook.com/TheSavannahTribune for details on how to win Falcon game tickets..